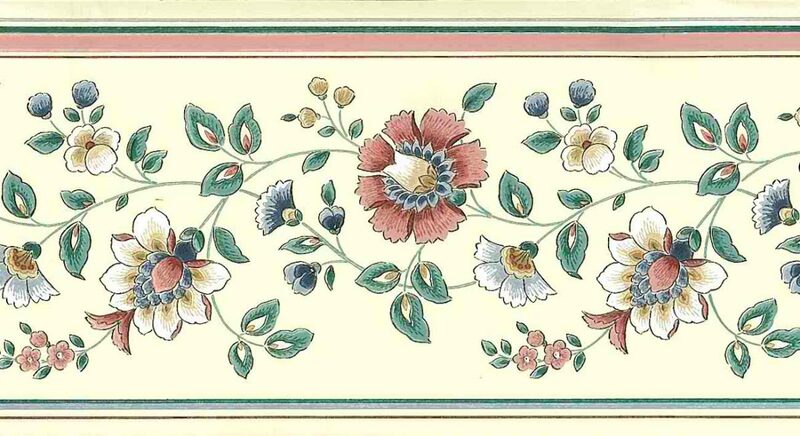 Rose green vintage floral wall border with stylized flowers that have a paisley feel. In Rose, Pink, White and Blue with Green leaves on Cream. The flowers link to one another with in a vine like way. The top edge has Pink, Green, Rose bands and the bottom edge has narrower Green bands with a thin Rose band. The overall effect is of a cottage vintage pattern. Ideal for a Guest Bedroom or an informal Dining Room.